There are many factors are traditionally associated with heart disease such as high cholesterol, obesity and smoking. Now we can add male pattern baldness and premature grey hairs in men, which, according to research presented at the 69th Annual Conference of the Cardiological Society of India causes a five-fold increase in risk of coronary artery disease (CAD). 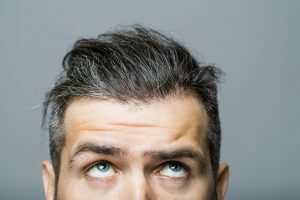 Researchers at the U.N. Mehta Institute of Cardiology and Research Centre, Ahmedabad, Gujarat, India looked at the link between premature hair greying and alopecia patterns in young Indian men with CAD. They found that young men aged less than 40 years old with CAD had a higher prevalence of premature greying (50% versus 30%) and male-pattern baldness (49% versus 27%) compared to healthy controls. In fact, male-pattern baldness was associated with a 5.6 times greater risk of coronary artery disease (95% confidence interval [CI] 4.0–7.8, p<0.0001) and premature greying was associated with a 5.3 times greater risk (95% CI 3.7–7.5, p<0.0001). Obesity was associated with a four-fold increased risk of CAD. This research made headlines in the mainstream media. However, beyond the headlines these risk factors could be important tools for helping determine total cardiovascular risk.